It’s easy to learn how to make lollipops at home – all you need is to pick the lollipop recipe you want. There are a huge variety of recipes available online for them, some easier to make than others, some healthier than others. 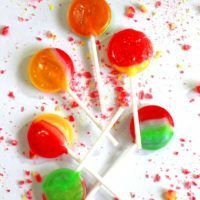 Depending which lollipop recipe you use, making lollipops at home may or may not be cheaper than buying them at stores. But they’re fun to make! You can get creative with the flavors and the look of them. And if you want to avoid corn syrup or refined sugar, or make your own unique flavors, the homemade route is the way to go. You can put your own twist on any of these recipes to create something really unique. It’s so fun and easy once you know how to make lollipops. The basic technique with any lollipop recipe is: pour the melted liquid into a mold, stick a lollipop stick in it, and wait for it to cool. Then you’ve got your lollipop. 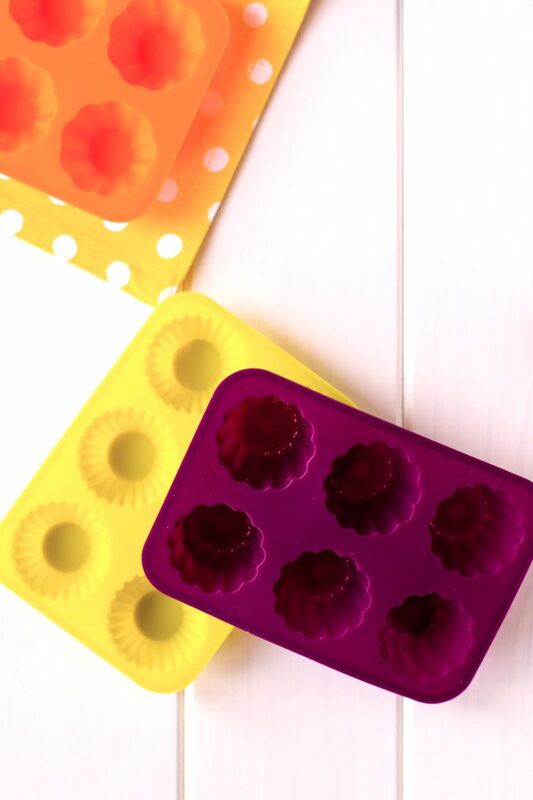 The best type of mold to use is a silicone mold for candy. They’re flexible, so it’s easy to pop the cooled lollipop out of the mold. And they’re non-stick without having any weird chemicals. But you don’t have to have a mold. 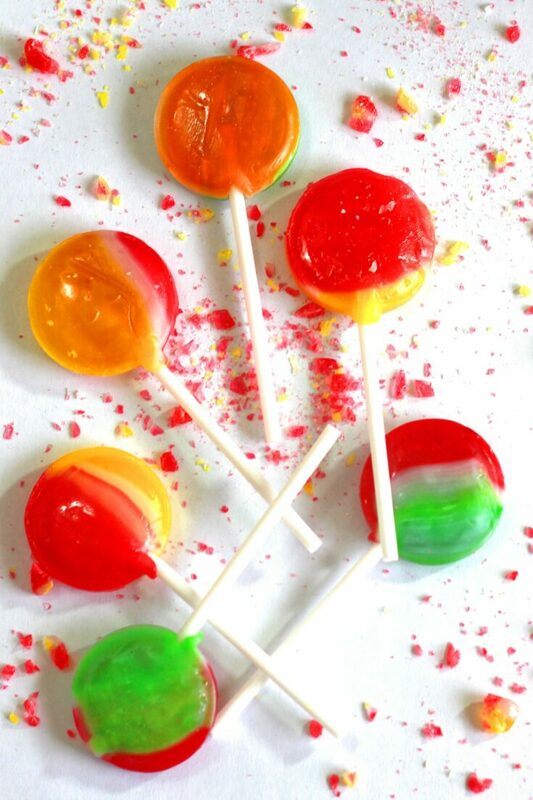 You can make wonky lollipops instead – no mold, totally freeform. Kids actually enjoy getting to shape their own lollipops. And you don’t have to use specialized lollipop sticks. You can also use wooden coffee stirrers, stir straws or anything similar. But plastic lollipop sticks are another option. While they’re not biodegradable like the wooden coffee stirrers, you can reuse them many times over. These are the most basic and easy homemade lollipop recipes I know of. 1. Glossy Lollipops. 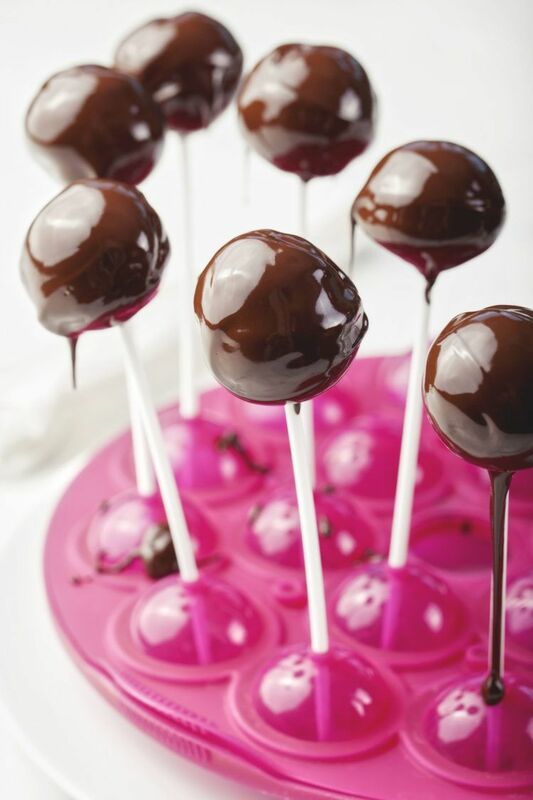 Many of the homemade recipes result in lollipops that have a fairly matte finish, as opposed to the glossy, shiny look most commercial lollipops have. 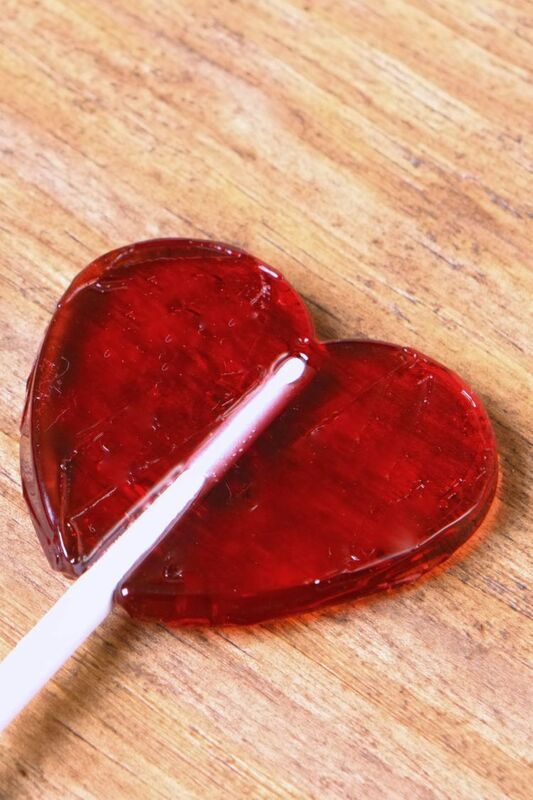 Sandra Lee’s Cherry Lollipops use gelatin mix to get a really smooth, glassy look. This is great if you’re going for a professional look. 2. Hard Candy Mosaic Lollipops. Christine Moore shares a Peppermint Lollipop recipe that involves putting pieces of hard candy into the molds before you pour the lollipop mixture. 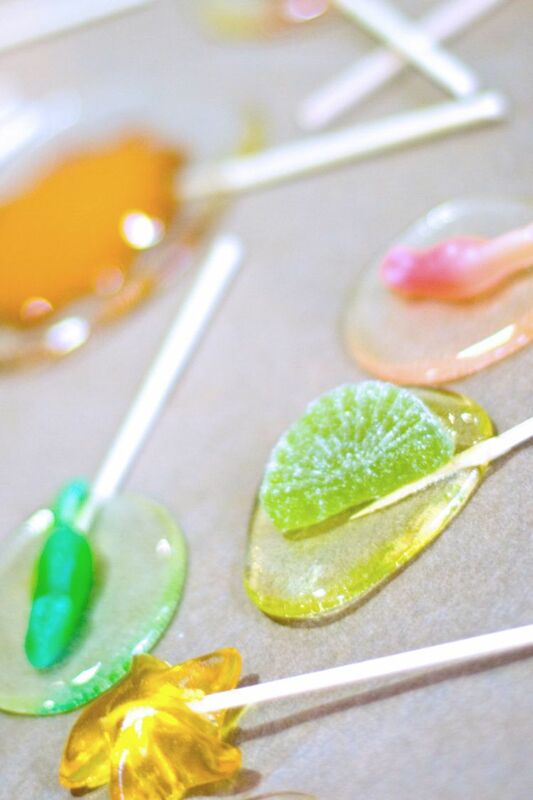 Learn how to make these lollipops that look so cool and have such a neat taste surprise at the end. 3. Honey and Fruit Juice Lollipops. You can actually make a very tasty lollipop without refined sugar, corn syrup or artificial sweeteners. You can instead use honey and fruit juice. Just swap out the cinnamon with any flavoring you prefer, and you’ve got a delicious, sweet lollipop without any of those chemical additives. 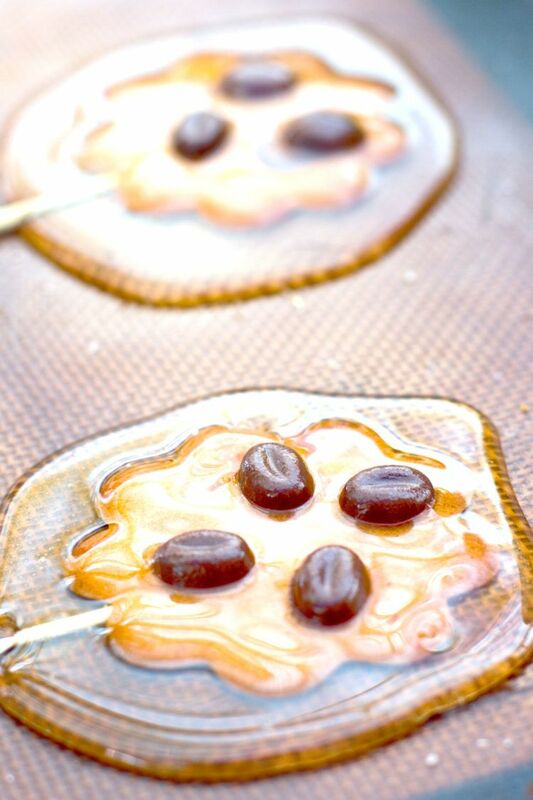 Once you get the hang of how to make lollipops with honey and fruit juice instead of corn syrup, you can also add little chunks of fruit – or coffee beans. Or chocolate. Almost anything that won’t melt quickly. You can also adapt most any other recipe to this one, if you just want to eliminate the chemical sweeteners. Just change your flavors around to make it exactly how you want it. Note: this is not necessarily suitable for diabetics, as it still contains natural sugars. This is for people who can tolerate sugar, but just prefer less chemically refined versions of it. You can also use sugar in non-refined forms. Look for “evaporated cane juice”, “turbinado sugar“, etc. 4. Chocolate Lollipops. And what about chocolate lollipops? That recipe is easy enough for kids to help with. You’re just melting chocolate bars, letting them cool in the mold and inserting the stick. Very simple, and you know how good they’re going to taste. You can also make one of the other lollipop recipes from this page and then dip them into melted chocolate. Again, if you’re trying to avoid refined sugar and other chemical sweeteners, you can. Just look at the Paul Newman line of chocolate bars, Green & Black and a few others specialty lines. They use evaporated cane sugar. 5. No Corn Syrup Lollipops. These no corn syrup lollipops taste and look wonderful. They’ll make you wonder why anyone makes them with corn syrup in the first place. This lollipop recipe doesn't use any corn syrup. It's easy to make and tastes delicious. Combine the sugar and Cream of Tartar with the water. Stir them together until the sugar is dissolved. Boil the mixture until it's 290 degrees F, or until putting a drop of it in cold water results in a hard bead. Take it off the heat and then add the flavoring and coloring. Pour the mixture into greased molds. When it's cool enough to hold the lollipop stick, put the stick in. Put in a refrigerator for a few hours to let it harden. Oh where have I been – this is so cool, my kids will love making these!!! I would love to know if Stevia for Baking would work? I tried the recipe with raw organic sugar and after setting the lollipops went granulated. Any idea why? It’s hard to say exactly, but my guess would be it wasn’t stirred up enough beforehand? Organics maintain proteins and plant matter vs refined sugar is just sugar. Chemically organic raw sugar may need to be pre liquified befor candying to break down the complex proteins. Ergo refining the sugar to basic table sugar if ground. it would be nice if the recipe had a print option. It does – look at the round green buttons at the top and bottom of the post. It depends what size you make them. If you do small round discs, probably a couple of dozen? If you make them bigger, it would be less. The landrace Lee link and the sugar and corn syrup free recipe don’t work. I’m looking for a sugar/corn free lollipop recipe that stats hard and doesn’t need to be kept in the fridge. That should say Sandra Lee not landrace. I don’t know what my phone was doing. The broken links have been replaced now. I tried these lollipops and they were delicious!! I loved their taste and the way they looked. It was so fun and easy to make! Everyone who has seen this recipe should definitely try them out! Can I use white wine to make these lollipops? I’ve never tried it. You’d need to mix it with something that solidifies at room temperature, like hard candy.